If you've been following along on Instragram you would have noticed a change of location for me over the last couple of weeks. I was off on a textile adventure in Swaziland learning how to batik. Yes, I know it's a long way to go for a new technique, but I love travel and love textiles, so this way I get to combine the two, without too much sightseeing, which I don't enjoy so much. While batik originated in Indonesia, what we know as African wax prints began as an attempt by the Dutch to take over the textile market in Indonesia using a cheaper technique. Thankfully this didn't work in Indonesia, but the fabrics definitely took off in West Africa where local colour combinations and motifs were incorporated. 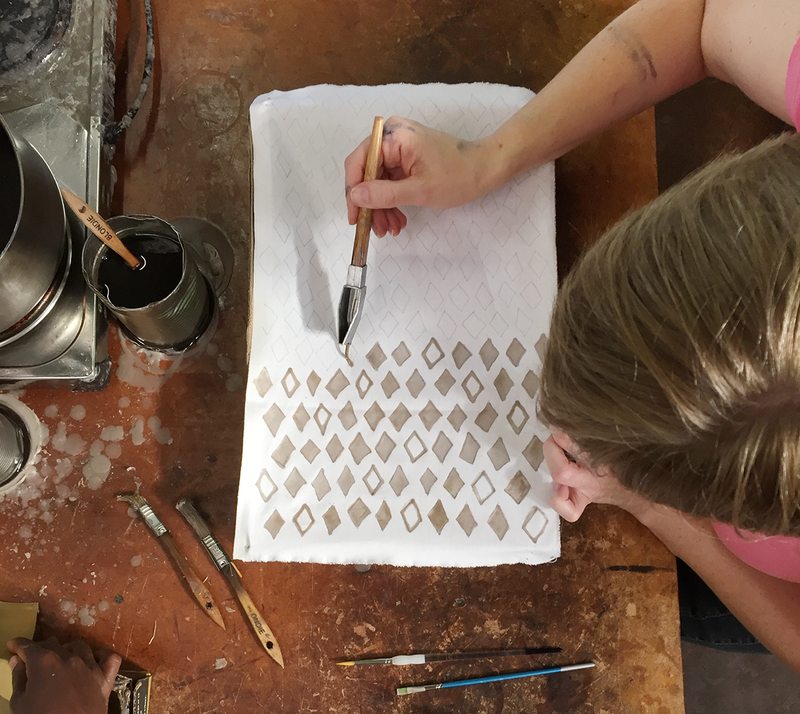 The wax prints are created a little like Indian block prints, but instead of using a wooden block dipped in ink to create colour, a copper block is dipped in wax then pressed into the fabric to create a resist when dyeing. Subsequent layers of wax are added, or partly removed, then the fabric is dyed further to create the wildly colourful wax prints we know today. At Baobab Batik we were using a brush and the Indonesian tjanting (pictured below) to apply the wax and create our patterns. 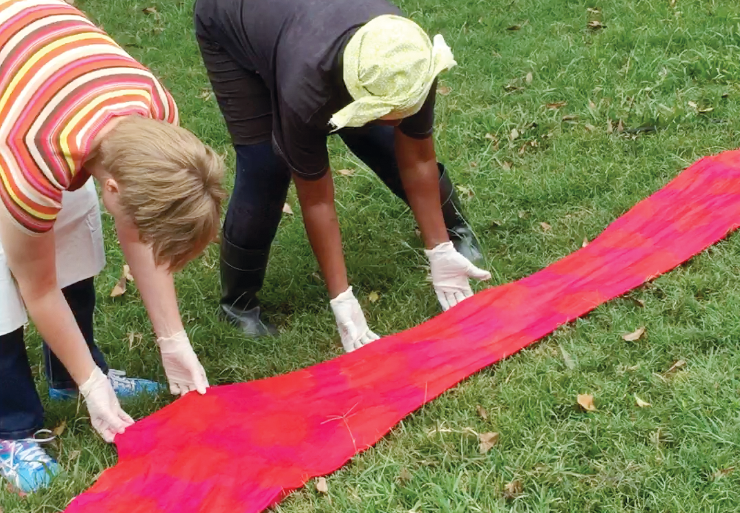 We had three special days, being taught by a wonderful group of women, how to apply wax, how to recognise when it was too hot or too cold, and how to apply the layers of dye and fix them to the fabric. The first day I spent creating little samples and getting used to both the waxing and dyeing techniques. You kind of have to think in reverse being a resist technique and that takes some getting used to. The second day I made my apron with a modified version of the design I created in the navy and pale green below. You can see all the apron details over on Instagram. On the third day I decided to make leggings using a technique and pattern that Baobab Batik created. In this instance you have to start with the dye, and that's what you can see me applying in the pictures below. 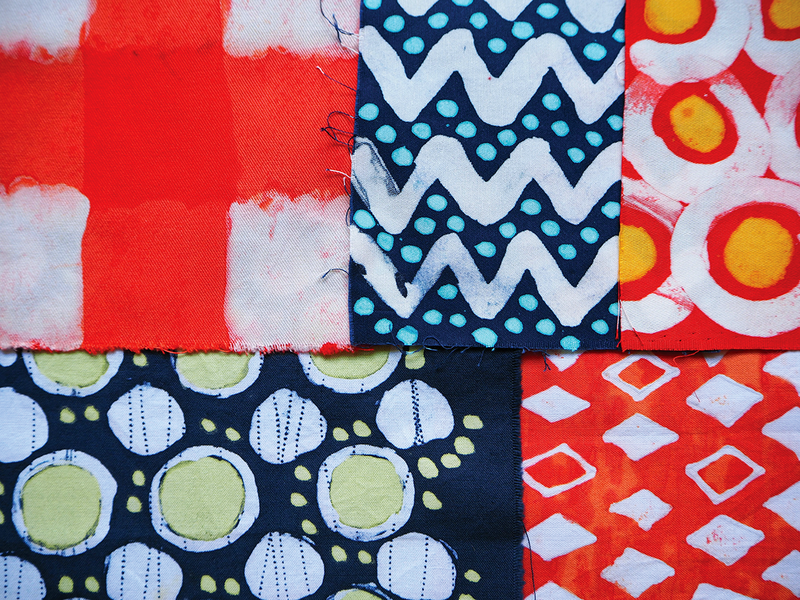 Normally Baobab Batik use a rainbow of colours to create this pattern which they call stained glass. I decided to use pink, orange and red as I figured I was more likely to wear that (evidenced by my matching top in the pic!). This caused quite a stir in the colour house with the women calling others over to see what I was doing. Bonsile watching on, with Busi pretending to help. Bonsile helping me lay out the leggings. On this last day, we all had a picnic lunch together out on the grass. It was really lovely to sit and chat to the women we may not necessarily have spent so much time with over the previous two days and to hear their stories, learn about their families and their everyday lives. We were also treated to some fabulous singing and dancing after lunch. When that finished I was promptly sent back inside to wax like a crazy person as it was our last afternoon at the wax pots. My pattern is slightly bigger and a bit more uniform than the way they are normally done, and there are sections where my wax was too hot. It's nice that I could also tell that on the day, but I didn't have time to stop and fix it – I was on a mission. Our leaving time came and went, with everyone else being dropped at our next destination and the bus coming back to get me so I had extra time to finish, which I was super grateful for. And the result? My finished leggings after waxing and their final dip in navy dye. Do you know, these are the first leggings I've ever tried on that are actually long enough for me too. Win/win all round, I say. Now, before I head off, I just wanted to show you what the professional product looks like – drying in the sun, below. To see more of their beautiful work and learn the Baobab Batik story, head over to the website (link above first pic), or check out their Instagram feed. Last, but not least, I wanted to mention that this is the third trip I've done with Ace Camps and I can't recommend them highly enough for anyone looking for a holiday with a difference – wonderful people, interesting locations, lovely accommodation and a learning experience to boot. And no, this post isn't sponsored, I just think they're fabulous – check them out! Those leggings are fabulous. What material they made of? Who sewed them. I'm amazed that you didn't miss the plane back home. 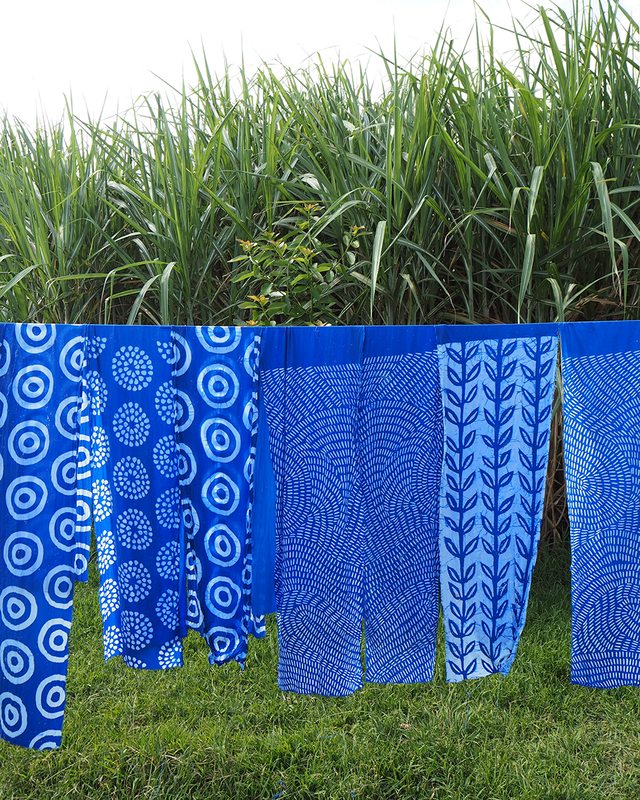 They're made from cotton jersey, and they were sewn by the women at Baobab Batik. We worked on the base textile shape and then they turned them into product for us. Yes - very funky tights TJ! I love the final image - the blue is so pretty. It sounds like another great trip and would love to embark on an Ace Camp with you one day! Yep, that blue is lovely isn't it? That'd be excellent to have you along one day Stace!